Spring flower snowdrop is the first flower in the end of winter and the beginning of spring. A group of spring flowers of white snowdrops on a meadow. First snowdrop growing from snow. Close-up white spring flowers. Galanthus nivalis. Awakening nature. 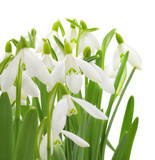 The first spring flowers of snowdrops bloomed on a dark background. Macro. Place for text. Snowdrop flower isolated on white. Spring flowers in the forest. 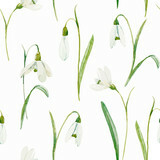 Snowdrop flower. Snowdrops (Galanthus) in the spring forest. Harbingers of warming symbolize the arrival of spring. 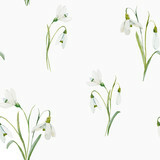 Fresh snowdrops on blue background with place for text. Spring greeting card. Mother day. Flat lay. Snowdrops on bokeh background in sunny spring garden under sunbeams. Spring snowdrops flower. Bright natural background with sunny reflection. Spring flowers snowdrops on a brown background. Macro.